Sambar is a delicious gluten-free and vegan South Indian curry. It is loaded with a variety of vegetables and lentils. 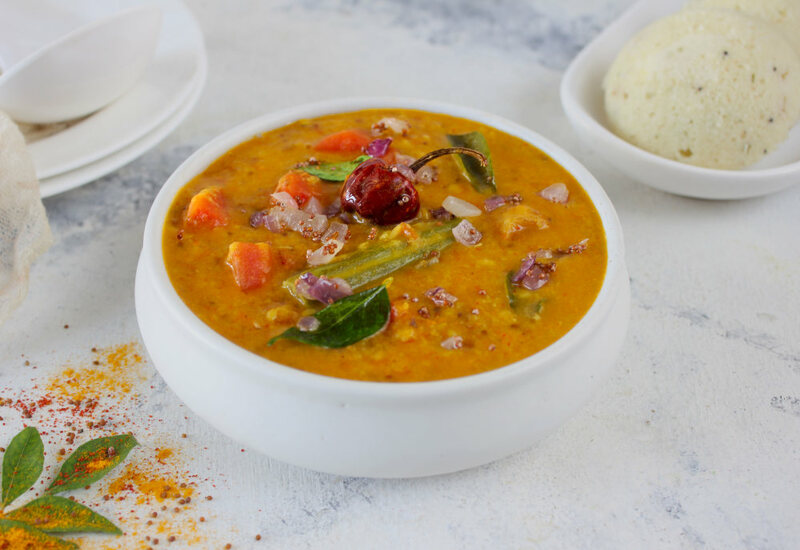 It is an ultimate sweet, spicy, and succulent vegetarian stew accompanied by either idli, dosa, vada, or steamed rice.​ Making sambar in a pressure cooker is really fun and saves a lot of time. Substitute lentils for pigeon peas. Drumsticks are a vegetable from the same tree that moringa leaves come from. They are similar to a green pea pod. If you can't find drumsticks, substitute green beans or okra. Per Serving: 215 calories; 10g fat; 23.1g carbohydrates; 10g protein; 29mg cholesterol; 347mg sodium.